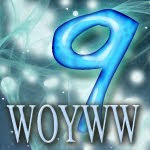 You may have the WOYWW logo and link in your sidebar. If you have, thank you! Regretfully, you now have a picture from Photobucket telling you that hosting of the image has expired. Sorry about that, it's not very pretty and I was hoping to beat them to it. Epic fail! 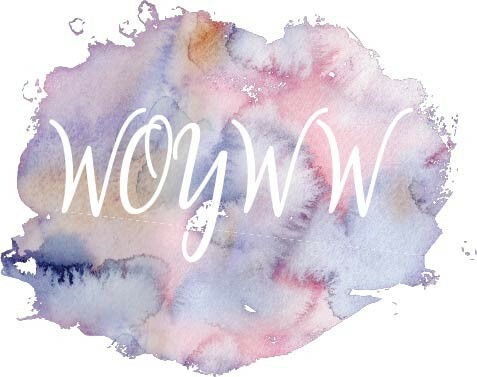 WOYWWers, Deskers, gentle reader...there is a new WOYW logo! My Creative Director (Sissy Stephanie) told me that the original logo was old and out of date in style, so she whipped up a couple of others to choose from! And because things have moved on so far, I don't think it will need a hosting service if you want to add it to your sidebar as a link. First, copy this image to your computer. Or save it...whatever you have to do. On Blogger, go into the dashboard, select Layout and then select 'Add a Gadget'. It will pop up a menu full of gadgets you can add, so at this point, don't get carried away.Go to 'Image' and click the + sign at right end of the box. This throws up another page into which you type the URL for this blog - www.stamping-ground.blogspot.co.uk - and then add the picture. Click the 'shrink to fit ' option box too. It should load and take it's place in your side bar. Don't forget to delete the gadget with the out of date (Photobucket) logo! At about this time of year, I treat myself to a new notebook. It's usually quite slim and will eventually contain my Christmas lists. Slim so that I can carry it in a handbag whilst shopping, and lists - of course- because my memory is not up to the job of keeping catalogue of who's getting what! This year, I have no need to purchase. The lovely Kathy showered me with journal/notebooks as a gift when we met in the States last month. (Last month..it's slipping away from me already!) And I've started using this....it reminds me of Kathy, our meeting, the sunshine, the Native American vibe that runs through so much of our trip - oh everything! Kathy is a Sheena Douglas fan ( like so many of us), and has used her faux leather technique to cover these books. Aren't they amazing. And truly, even when handling them, there's little concept of their being card, especially as each cover has a beautiful inside to enjoy too. So that means there's still more sharing to do! If you'd like to be in with a chance of owning one of these hand stitched treasures, please comment to that effect. If there are more than two, we'll do a random drawing. I think it will make Kathy blush to see that I'm carrying through my 'threat' to share her skill, but really, these do deserve to be loved and used don't you agree! The real beauty for me is in the using. A gifted notebook in which to write notes about gifting. Perfect circularism. Or something. Thank you again, Kathy! Well there's an improvement! I cleared up yesterday and will be tinkering with card making as and when I can get to it. Hurrah! That lovely black and white file is a ring binder with plastic pockets with magnetic sheets. It's full of my dies. It's not completely full, but crikey, it's heavy! As you can see, I was cutting out some leaping reindeer. Jut to try the die out really. Not feeling the whole Christmas card thing to be honest! The splattering of pens was caused by having a need for one colour and a too full pencil case! But that's OK, they'll all be wedged back in shortly, and that will make the desk look considerably tidy! Share share share, am in need of looking...will take you with me today, more appointments and waiting is the forecast! It seems to have been a while since I posted anything that I've made. I talk a lot about what I'm going to do.....! Before we went to visit her, my sister was excited to tell me that her friends had already extended invitations to us for food and coffees and warm, friendly socialising. I decided a few hostess presents were necessary. Well of course, I left it quite late! I did have a lot of fun using up some scraps and trying to come up with a few ideas to encompass a few occasions! Stickers on white card, cut out. Words from an embossing folder by Cuttlebug, I think. It's quite old now, but I use it a lot, so in terms of purchase value, it's been a great one! This is the inside of both the sticker-made cards. I used but 'doctored' the text that came with this lovely fox from Francoise for Woodware. 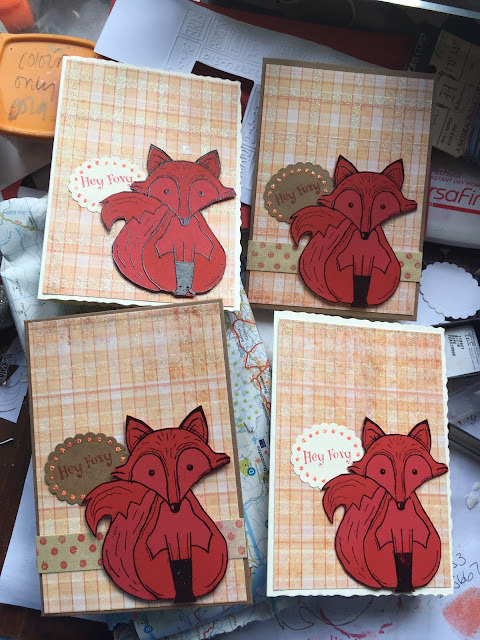 This ended up as a workshop card too, I liked the red fox! These graphic florals are by Woodware too. You can see there are subtle differences in mounting and more obvious differences in the colouring. 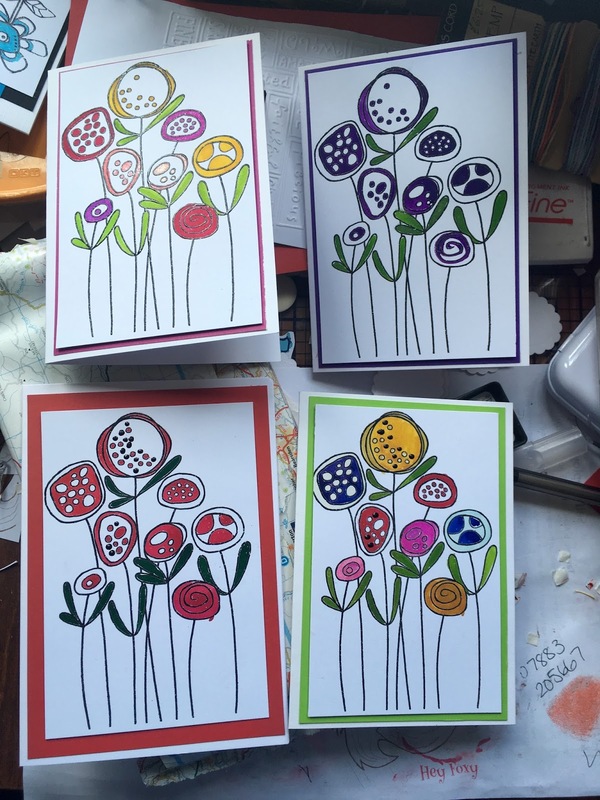 These actually illustrate very well the sort of trials I make before I end up with a card I'm happy with for a workshop. In this case, the card that won as a workshop sample was mounted on yellow and all the flowers were coloured in yellow. I think they look more striking in a single colour. Not what Mother Nature would say, for sure! These are pretty basic cards, all die cut, so not a lot of brain work involved, but the paper by Kaisercraft is incredibly pretty if you ask me. The green strip across them is the reverse of the floral paper, so very good use of a big old scrap! I'm going to keep trying this process. 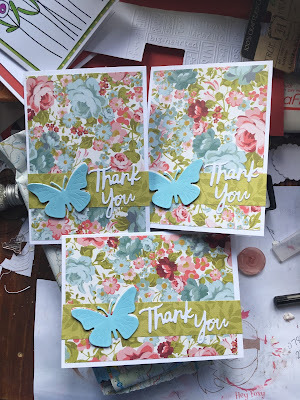 Very often I make a couple of card fronts (I nearly always make a front rather than working on the card itself..it's cheaper to throw away and than a pre-scored card. And it keeps my card-to-envelope tally pretty even! I'm doing that five minutes here and there thing, and it doesn't involve tidying and sorting. I will...because it's driving me nuts! You can see the Summer workshop schedule, which is there to prompt me to at least think about the next workshop. Below that, you can see a few packets...they are new clear stamps. And on the right next to the tape gun - there's a new die. All Christmas themed. Shopkeeper Gal made me, she said I needed them. The brown paper bag at left contains squashed pennies and other such nonsense souvenirs from the USA. The little wallet thing at far right is full of tickets and receipts from our hols...you'd think, wouldn't you, that I was getting ready to scrapbook! The truth is naturally, more to do with not having put them away properly! Share your work space will you? Especially if you're feeling a bit smug about how tidy it is compared to mine! Of course, breakfast is the first thing...the bacon comes with the pancakes....I re-jigged it for eating purposes. I had heard of, but not tasted the maple syrup-on-bacon-pancakes thing. I didn't care for it, but it didn't stop me re-arranging the combination. Best ever - a breakfast that includes a pudding! Whilst we toured, we ate huge breakfasts at a variety of roadside diners. Where possible we chose independent diners...my word they were amazing. Every one of them was a potential film set! 'At home' in Idaho, Billiam was concerned that we try all the traditions and so this is the famous 'biscuits and gravy'. I know it looks like mushrooms, but it's actually quite highly herby and peppery sausage in the gravy. The 'biscuits' are rather like savoury scones, slightly less doughy perhaps. For five days I enjoyed coffee with 'Half and Half' in it. Then my sister told me it wasn't half fat milk it was half full milk and half cream. No wonder I liked it. Biscuits and gravy, courtesy of Billiam, chef of the day. Most of the eating out was done on our road trip. At 'home' in Eagle, we did home stuff and ate home food. As you do! It took me a few days to get used to the way that a server will clear the plates of anyone that's finished. Here, it's considered rude to clear until the last person has finished. In the States, not so. I lost the last few bites of several meals until I cottoned on and spoke up for myself! It's politely done, the most common phrase is 'let me get that empty tableware out of your way', which is very nice. I was always left eating on my own, I'm very slow. I talk too much. The best Milkshake I've ever had..a cup full of soft ice cream swirled with huckleberries. Very noticeably, Americans eat a lot of cheese. And they know their cheeses. Wherever we ate, there was cheese. Every sandwich, 'enhanced' with a slice of Emmental or Gouda or Swiss something or other...no matter what other contents were between the slices of bread. Of course, burgers - Feta was very popular on burgers in Boise. Parmesan by the bucket load, added to hot chips (very nice), sprinkled over salads, and an addition to pizza, but ironically to us, not offered when we actually had a Bolognese. Of course, Macaroni Cheese appears on menus in Diners and five star restaurants alike...sometimes called different things, but Mac and Cheese it was. At Boise airport there were two places to eat and neither of them had a single savoury item on the menu that didn't include cheese. Largely the cheese is an addition that over here, we wouldn't have thought of, or noticed the lack of. For someone that can take or leave it, it became a bit of a habit to ask 'hold the cheese'! And that really is a huge difference that was immediately obvious. 'Hold the cheese', 'add such and such', 'put the whatever on the side'. Massive menus that are then manipulated to suit the eater. It must drive the kitchen and washing up staff absolutely crackers. Didn't seem that way though. Nothing seemed too much trouble, to be honest. Well, actually, one thing did. Getting a drink. Alcohol. I know and was expecting the rules to change from State to State, and I know in particular that in Utah it is less 'easy' to drink than other States. But we were a bit surprised when turned away from a restaurant-bar in Utah because I had no photo ID. We wanted a beer and a steak - we had been able to smell the grill from down the street. They couldn't let us in without ID even when we promised not to try to order drinks. Wow. Wasn't expecting any exceptions; rules is rules. And yet, somehow, at 52.11 and 56.5 years old, it did seem a bit silly. Especially as the next night, we went to a ballgame (Go Bees!) and managed to buy a couple of beers without so much as a whisper about age or ID. Mind you - it was expensive enough to probably prevent under-age drinkers from even trying. EIGHT dollars, and it wasn't even a pint! I have no pictures, but I do have the plastic glass, one of my more expensive tacky souvenirs! And finally, I have completely and utterly won the prize. Solved the puzzle. Got an answer. Our American cousins eat fruit with their savoury 'main meals' because....there's never room for pudding! I can't count the number of meals I had that turned up and included a fruit salad. We were invited to supper at a friend's and enjoyed beautifully grilled steak with a strawberry and blueberry salad. Absolutely delish. And for once in the whole trip..just once, my eyes weren't bigger than my belly. 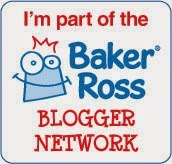 Since Blogger last updated, I'm struggling with basic editorial, font sizes, alignment, picture placing.....anyone else? These two lines of text really illustrate it! Well, this may be a what's not....over here at my place, it's all going on, and I have only cleared my desk off in order to work at it. I have not tidied..the cleared 'stuff' is in a pile on a chair. But, now I have the workshop ready to roll, I can get to tidying and straightening. I need to. It's driving me crackers. Look - early morning coffee, and ta na! In the basket, my first Christmas card of the season. I have to say Season, because in crafting retail world, it IS the Season. Demand is there for those that are hugely well organised, and so...one of the cards in this weeks workshop is for Christmas. The lovely stars and stripes pencils were part of a gift from my American Sissy, and there you see the real book of 'Me'. It's not in the same place with dust on it, like so many features on my desk - it's in the same place because it's actually a convenient place to keep it and write in it! It has some very pertinent questions in it...I may have to leave it for publication with my will! Share what you're up to, will you, we need to see, especially if you're one of the hugely Seasonally prepared! I'll be late to visit, I have an appointment with the neuro rehab team at Southampton hospital. They've been amazing in helping me work off the worst of the facial palsy and I think this will be the last visit! I've never met an American I didn't like. The young and burly Homeland Security guy that I met at immigration may have scared me a little, but he was perfectly pleasant. And wonderfully efficient. The young man in Utah that took $200 dollars off us after our car was towed...extremely nice, very friendly and almost apologetic. Obviously, I haven't met the entire nation, and I fully accept that there will be exceptions. And I'm big and ugly enough to accept that not everyone is going to like me. Taken from a bus in Utah; Zion National Park, I think! Our recent trip has reinforced the belief that everyone will be polite and friendly, in response to polite and friendly. I love that the guy at the table next to us in the Bakery at Kanab, Utah recognised our accents and wanted to tell us all about his trip to Great Britain, that the girl who served us Pizza in Flagstaff, Arizona thought we were Canadian, and that a very nice young woman in Anthropologie,(back in Eagle, Idaho) admired my sandals, which caused me such surprise that her kind enthusiasm for my accent left me a little word shy. See how I got three States into the story? We met a lot of people. I had a message from Kathy that she lived a mere 5 hours from Idaho, read my blog and would like to meet. So....we did. Mike wore a collared shirt to meet us on account of our being British. Perfect! Now if ever the presumption of friendship is thrown into question, you can quote this 'incident'. Kathy is not (yet) a blogger, but she reads WOYWW and follows several of us Deskers. You will have seen her desk on WOYWW422 (the wrongly numbered one). We may never have met, but we already know that we have craft in common. And then, the rest comes naturally. I think both of our husbands came because it's a long journey...but also, it's 'strangers off the internet' again isn't it, and if either of us had indeed turned out to be axe murderers, our heroes were there to defend us. In reality, we had a lovely meal, lots of soda (because it was hot, man and we had a lot to talk about). Four hours after we met, Mike started to make noises about going home, after all, its over a two hour trip. It only took another 40 minutes to get us to the point of departure....there is always so much to say. I hope, Kathy, that you're reading this in your wonderful craft space and thinking of the nice afternoon we had together, and I really hope that we can repeat it! Oh, and just as a by-the-way...I didn't buy anything in Anthropologie. Strong and sensible shopper! It really is 422 gentle Desker. Many of you noticed that by going away, I stepped into a time warp and well, cocked up the week numbers! LLJ reminded me yesterday to repeat last week. Making sense? Oh good. It's nice and warm, so the door is open, and gives you a great view of 3 weeks growth on the building site. The pink flower is an ever-lasting sweet pea which we dug up last summer. Despite the trunk being as thick as my wrist, it appears that we didn't get the better of it! The rest of the green is just weeds and I shall be out there, regaining control, any day now. My desk is piled with stuff. Top right are bits from card making and some bits to scrapbook that survived the clean-up before we went away. Apart from the ice cream tub, the rest is leaflets, souvenirs, purchases and a couple of gifts from our US trip. The 'Me Journal' at front right was a gift from a new friend..seems she got me totally and utterly, huh! The wrapped and be-ribboned gift is from my Sissy for my birthday. She's organised! In the ice cream box there's a plastic beer glass from the Bees stadium in Salt Lake City. We went to a baseball game. The opportunity for plastic souvenirs was immense and irresistible. I'll talk more about some of these things soon. If that's a promise, show us all your, huh? 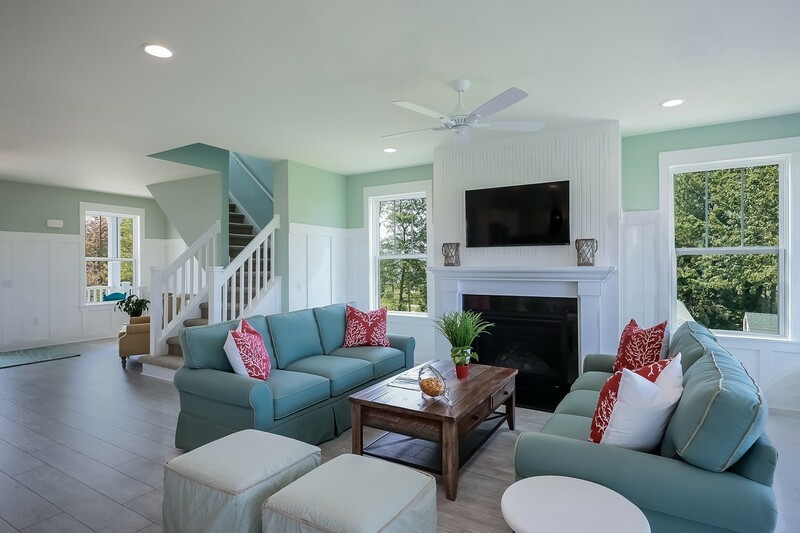 Link here and we'll visit. I thank you.